Yes, it’s K day, and time for a perfect character relationship. 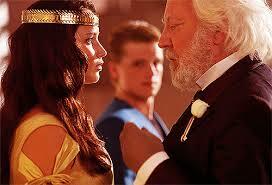 This time, it’s Katniss Everdeen and President Snow from The Hunger Games. Perfect?!? How is this relationship perfect? Well, Katniss and Snow fall into the enemy category. Personally, I love enemy relationships. I think they are dreadfully intriguing. Enemies can know each other so well, but from such an odd angle. They can be obsessive, and understand one another’s inner workings better than any friend or family member. And Katniss and Snow are, to me, perfect enemies because they go beyond suspicion and lies, turning that on its head to the point where their enemyship is so great, they can actually tell the truth and trust each other. There are three moments between these two that I love. Forgive me, though, it’s been a couple of years since I read the books, so I can’t remember exactly where, when, and what was said. I’ll do my best. The first is, I think, after the first Hunger Games, when he is crowning her victor, and they share a couple of happy words with one another. Internally, Katniss has a sarcastic thought something like ‘oh, what great friends we are’. She knows Snow hates her, and Snow knows she hates him. And they both know that each other knows. It’s like a vicious inside joke between them. The second is near the beginning of Catching Fire, when Snow comes to her house. They sit, discuss, and agree that they hate each other, and that they will not lie to each other about it anymore. Also, how awesome is it that Snow smells like roses and blood? The third is near the end of Mockingjay, when Katniss goes to Snow about the bombing, and Snow says something like ‘I thought we agreed not to lie to each other.’ He tells her he did not kill all those people, and explains why. And, the thing of it is, Katniss trusts him. She knows he is telling the truth, because they are such good enemies that she recognizes his honesty. So, what do you think, know of any perfect enemy relationships? Well, there's always the classic God v. Devil. That's one perfect enemy relationship, and it doesn't seem likely to go away soon. that really is a great enemy relationship…I've never thought of it that way before. Love the post. Very thought provoking. I don't know if you've read the books, but I loved the relationship between Sebastian and Clary in the Mortal Instruments. Very creepy and unexpected and crazy! Professor X and Magneto from "X-Men" make intriguing enemies, because, even while they're forever battling each other from opposite ends of the board, they're still friends! I love that you look at an enemy relationship. Those are great moments.